Fringed by the Indian Ocean on one side, sandwiched by Southern Africa on the other, Mozambique is a mango-drenched, coconut-infused, sun-ripened cocktail all unto its own. 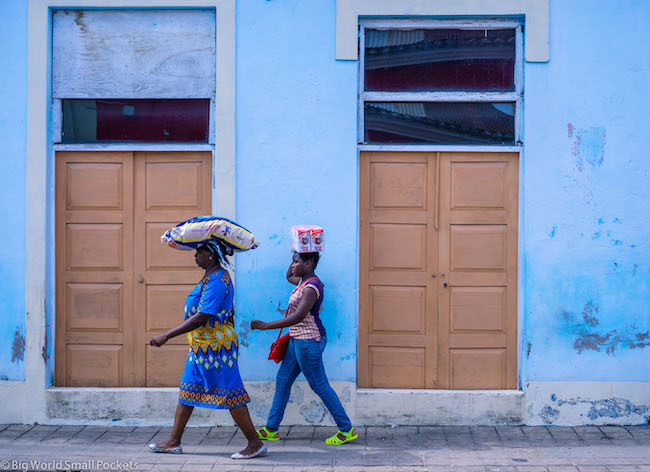 As women stroll past with huge baskets on their heads laden with goods or babies strapped to their backs in wraps of beautiful bright colours, or men play football in dusty pitches with bamboo poles for goal posts while children chase single bicycles up the red clay streets, the feeling Mozambique parts is distinctly African. Yet there’s several features that equally cast Mozambique in entirely its own light. And it’s a beautiful light. 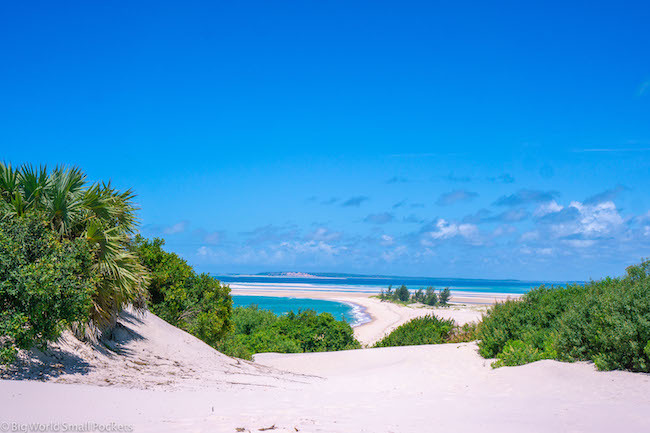 From the crystal clear waters of the lapping ocean to the endless white strips of sand, the cloudless blue sky days and the green tropical lushness all around, Mozambique, and its famous coastline, really are something to be seen. And in a continent as amazing as Africa, that’s quite something! 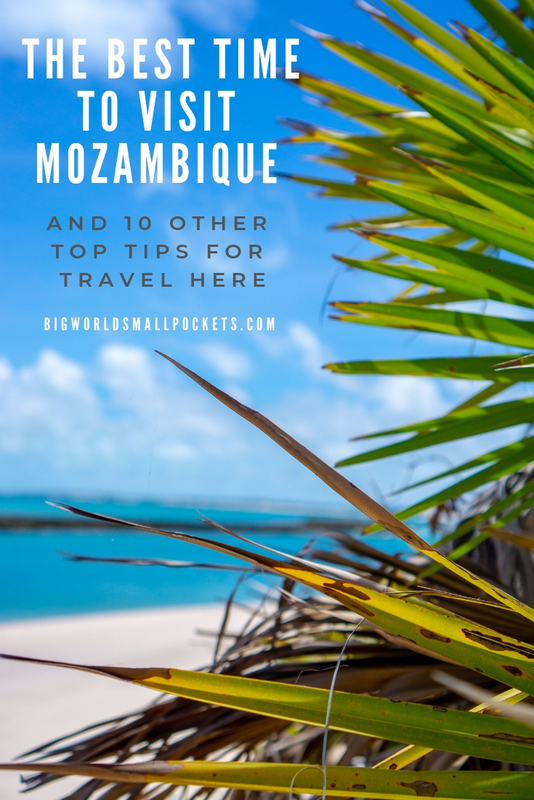 So here’s my round up of the best time to visit Mozambique, as well as 10 of my other top tips for travelling in this country, to help you get there before everyone else does! My trip to Mozambique was kindly sponsored by African Budget Safaris, but, as always, all views are my own. The best time to visit Mozambique is generally acknowledged to be the country’s winter, which falls roughly between the months of May and September. This is when humidity on the coast is at its lowest, rainfall also low and the tropical heat more bearable. Everywhere in the country is accessible during this time – no threat of cyclones or washed out roads – it’s still pleasantly warm and those godforsaken mosquitoes are far less in number too! Diving and snorkelling at this time of year is great and, besides the few weeks of South African school holidays that fall during this winter period, tourist crowds are thin on the ground and prices low! The times that the prices and crowds do skyrocket in Mozambique is during South African schools holidays – normally Christmas / New Year time and again at Easter – so avoid visiting then if you can. 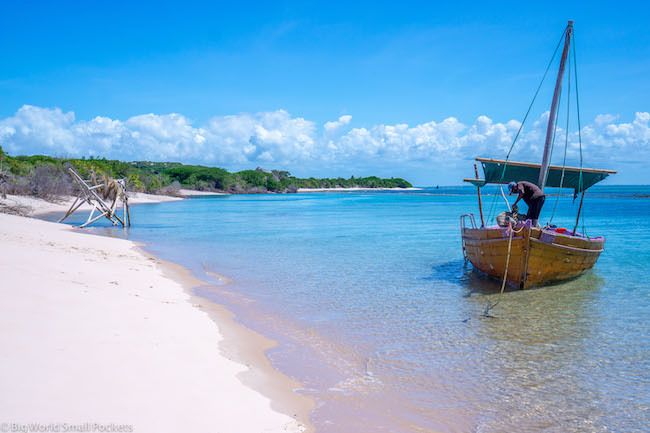 Other than that, Mozambique is not yet a big enough tourism destination or economically strong enough to pull off any crazy high prices or numbers, making it a haven for budget travellers and adventurous shoestring nomads the world over! Despite having endured a horrendous 17 year civil war that lasted until the early 90’s, the vast majority of Mozambique is now incredibly safe. Things are peaceful and stable, and everywhere in the country that I visited there was a distinctly calm sense on the streets, even at night. I can certainly vouch for Mozambique being a safe country to travel as a solo female (I felt safer walking in the cities here than I did in South Africa for example) and I never once felt any sketchy vibes, sneaky sideways glances on the street or had the sense that I needed to closely watch my possessions. That said, you must take the usual precautions of not flashing large sums of money around, not walking alone on the beaches at night, not driving alone at night or leaving valuables in view within a vehicle. 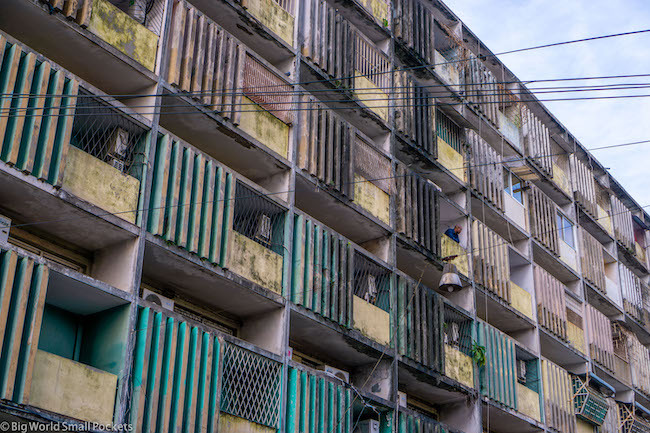 The only potential exception to this safety rule is in the Beira region in Central Mozambique, where tensions since the last election continue to simmer and have occasionally led to violent clashes or extremist behaviours. Do check the foreign advice given by the UK here for the latest safety information regarding this area and others in the north of the country. I would never think of travelling to Mozambique without proper coverage and always recommend travel insurance from World Nomads who I’ve used during my time in the country and throughout Africa. I love their great coverage of underwater activities – crucial for a country like Mozambique – as well as their excellent customer service and ability to claim online, which is very handy if you’re travelling in remote places for a long time. #3 What Is There to Do in Mozambique? 99.9% of the tourists that travel to Mozambique do so for the amazing coastline here. And with the turquoise Indian Ocean gently lapping coral reefs, perfect white stretches of sand and green tropical palm trees, it’s easy to see why! Therefore the best things to do in Mozambique revolve around the sun, sea and sand – namely snorkelling, diving, boat trips and ocean safaris. The Tofo / Barra Beach area of Inhambane offers the opportunity to see whale sharks and forms the main backpacker hub in the country. Further north, Vilanculos is the access point for boat trips to the remote paradise of the Bazaruto Archipelago. 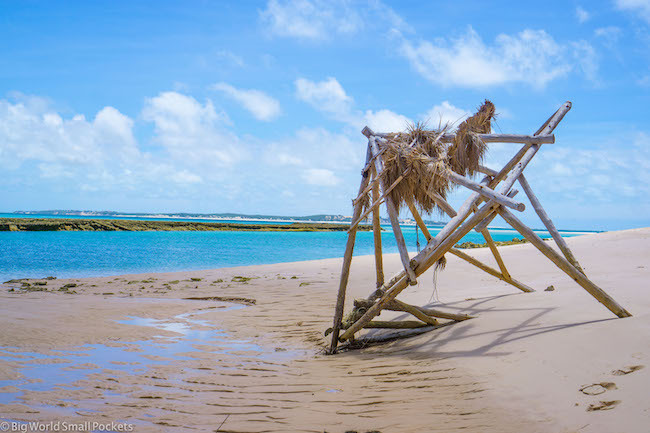 Further north still, there’s the historic UNESCO-listed Mozambique Island and further north than that again, you can head to the remote Quirimbas Archipelago, which boasts an amazing cultural diversity and a crumbling colonial feel. The city of Maputo is also a good place to visit in Mozambique for a night or 2, if only to see the contrast the capital has with the rest of the country, and there’s a couple of inland National Parks – namely Chimanimani and Gorongosa – that are meant to be interesting too, although sadly I’m yet to visit them. #4 How Can I Travel in Mozambique? And, while you can travel in Mozambique independently, the large distances, poor road conditions here and slow public transport can mean that if you want to see a lot of the country in a short amount of time, taking a budget tour, such as an overland adventure in Mozambique is a truly great way to see this country. I visited Mozambique with African Budget Safaris who are specialists in Southern and East Africa travel with years of professional experience in the field and who know exactly what they are talking about when it comes to matching your budget, timeframe and requirements to one of the hundreds of different tours they offer. Knowing I still wanted to tick safari-ing in Kruger National Park, snorkelling in Mozambique and seeing Swaziland (now called the Kingdom of eSwatini) off my bucket list, African Budget Safaris found me the perfect 2 week group tour. A mix of camping and accommodated nights, country bush and coastal bliss, well-priced and a small group size, this was the perfect budget tour for me as I got to take in 3 countries including a week in Mozambique. The only downside was that I wish it had been longer, because this country is AMAZING! Check out the exact tour I took with African Budget Safaris here. 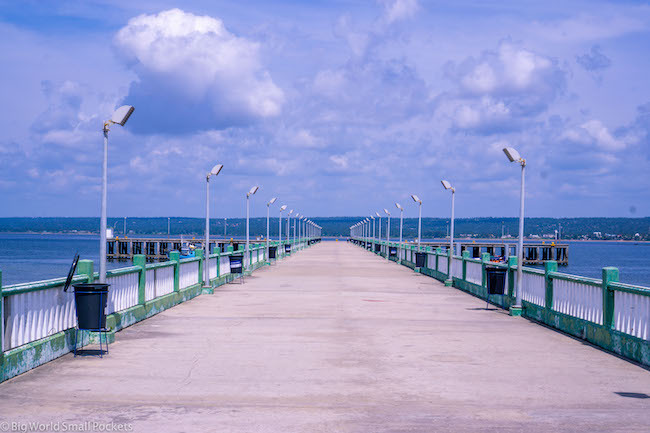 You can easily fly to Mozambique, with Maputo hosting an international airport and many other major cities across the country offering daily domestic flights, as well as routes from Johannesburg in South Africa and other regional airports. Otherwise, Mozambique shares land borders with 6 other African nations and has open borders with them all. They are South Africa, Swaziland (now known as the Kingdom of eSwatini), Zimbabwe, Zambia, Malawi and Tanzania. You can also get a boat across Lake Malawi to enter Mozambique. Tourist visas for Mozambique are required by most nations (there are some African exceptions) and are now available on arrival at most borders (land and air) due to a recent change in procedure. Otherwise, you may want to play it safe and get your Mozambique tourist visa in advance at a consulate, either in your home country or in a neighbouring one, such as South Africa. Depending on where you get your visa, it can cost anything between $70 – $100 USD and is valid for entry for 2 months after issue and allows you 30 days in the country. Domestic flights are certainly the quickest way to get around the huge country of Mozambique, if not a little pricey. Otherwise, a regular network of buses and minivans (known as chapas) ply the routes between cities and small towns and operate mostly in the morning. Normally seats are offered a first come first served basis, so get there early in the morning of your intended departure day to a get a ticket and a seat asap. As with most African buses, prices are cheap, but driving is bad! #7 What Should I Take to Mozambique? 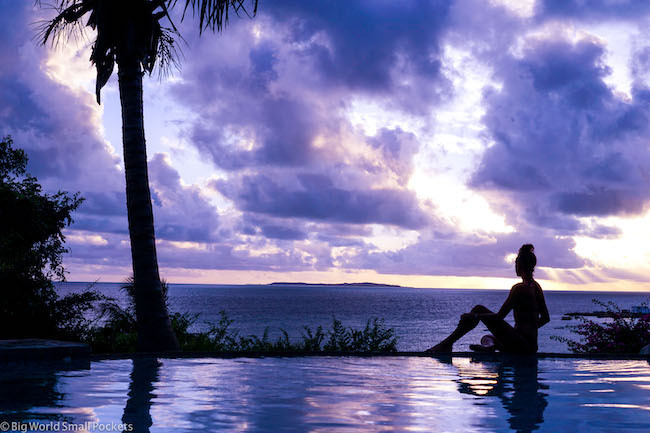 Swimwear and Sarong – One World Sarongs are always my go to. Beach Towel – I love the sand-free versions by Akumal. Sunscreen, sunhat, sunglasses – You can’t beat this cute Hello Sunshine sunhat in my opinion. 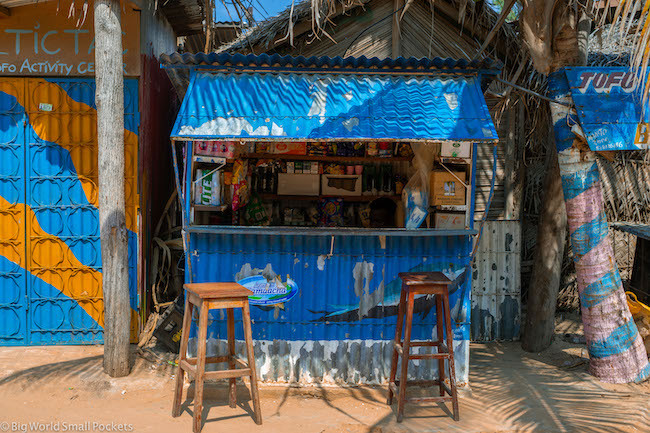 Bradt Lonely Planet Guidebook – Their Mozambique edition is excellent and very helpful. 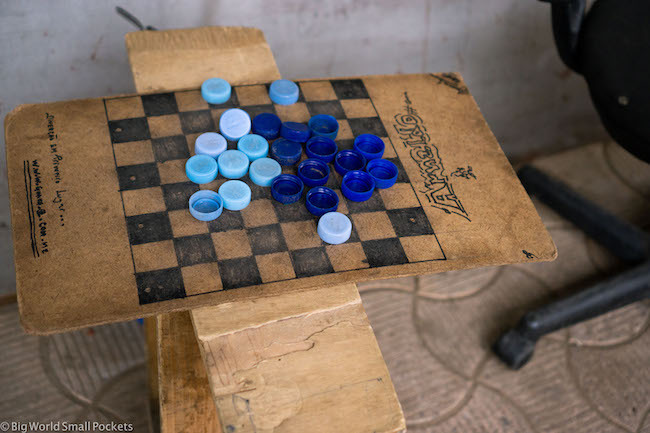 Insect Repellent and Anti-Malarials – I recommend a 30% DEET spray. European and South African power adapters – They mix and match in Mozam so best to have a World Adapter to cover all bases. Rain Jacket – This thin, windproof and waterproof one from North Face is great for Mozambique’s sticky, tropical climate. Camera and Lens – I love my Sony A6000 mirrorless, but a GoPro would also be great for the underwater action in Mozambique. Metal Straw – So you can enjoy fresh coconut water anywhere, anytime, metal straws are the way forward! 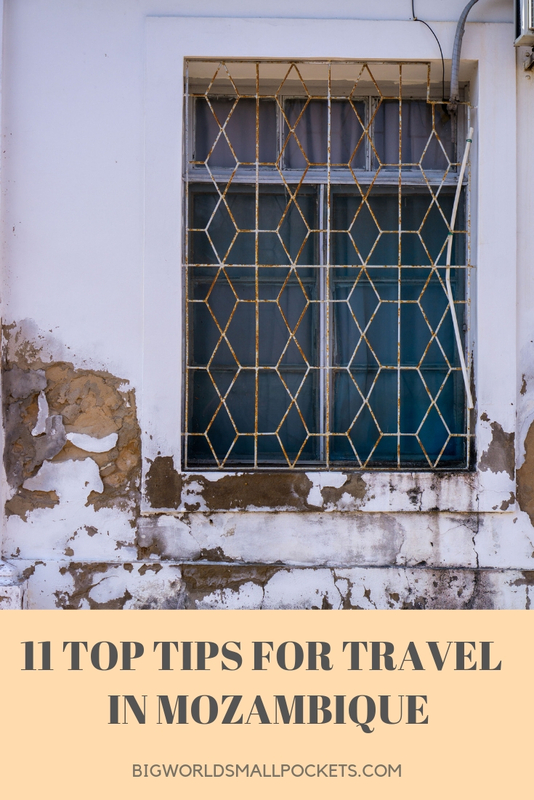 Good Sandals – You’ll live in sandals on the coast in Mozambique and I would never travel anywhere now without my trusty pair of Birkenstocks! #8 What is the Culture Like? Mozambique people are very friendly and welcoming to strangers. As well as speaking their own regional languages, all Mozambicans speak Portuguese, which is the country’s official language. In addition to this, many people in tourist areas speak English. 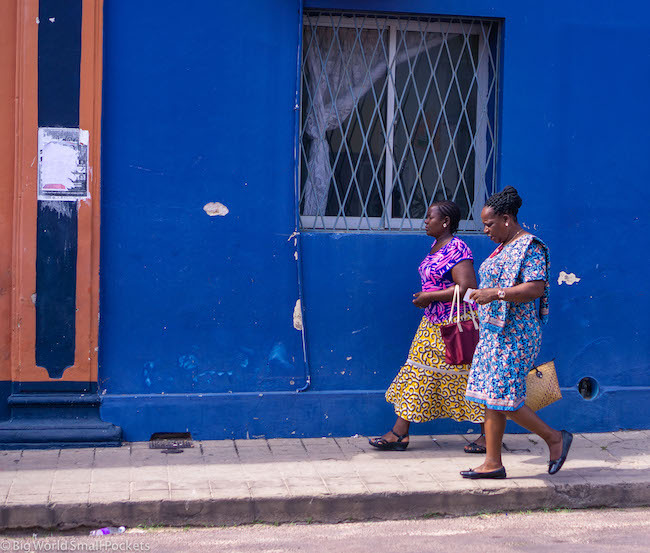 The predominant religion in Mozambique is Christianity, but Islam also has a strong presence and in most towns, churches and mosques can be found side by side and people living peacefully next door to one another. 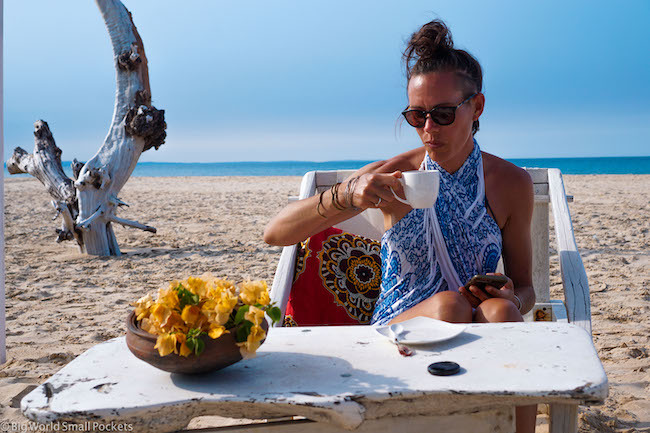 Dress standards aren’t conservative and most people wear western clothes, so solo female travellers need not worry about wearing shorts, skirts or sarongs, especially at the coast. It must be noted that Mozambique is not a rich country however and with the economy still recovering from the effects of the civil war, many children still do not go to school here and the average GDP is incredibly low. As such infrastructure is poor and services basic. That said, as is the joy of travelling most places in Africa, the people here are happy, friendly, upbeat and know how to have a good time. The local beer – 2M – is sold everywhere and drunk in abundance. Coffee and tea are widely available – always served with sugar, so request none if you don’t want any! 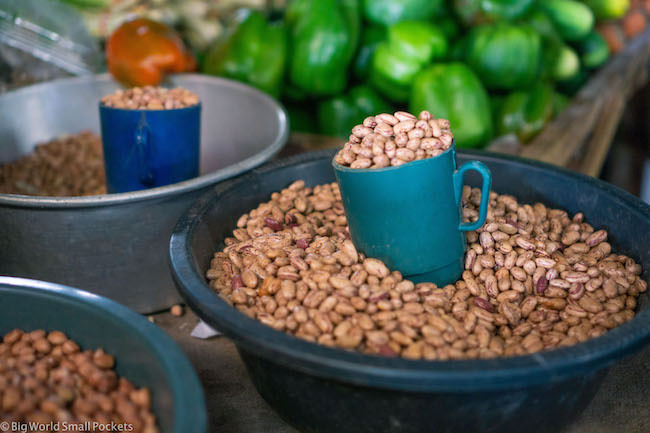 The coastal and tropical geographic position of Mozambique means a steady and good supply of fruits, nuts, seafood and vegetables – all fresh and incredibly cheap. As such, eating here as a vegetarian, pescatarian or carnivore is no problem and locals markets should be experienced at least once during your time in the country. #9 How Do I Pay for Things in Mozambique? Mozambique is predominantly a cash-based system – do not expect to be able to use a credit card anywhere outside of Maputo except, perhaps, in foreign-owned or fancy hotels. That said, ATMs are plentiful and easy to use across the country. Travelling with a Visa here will be better than Mastercard and it’s worth noting that there is often a fairly low ATM withdrawal limit. Foreign exchange offices can be found in many hotels, as well as banks, across Mozambique and the easiest money to change is USD and ZAR. The official currently is the Mozambique Metical (MZN), but almost everywhere you can also pay in South African Rand. Meticals come in 20, 50, 100, 200, 500 and 1000 notes. There are also a number of coins. As with most African countries, it’s wise to keep hold of your small Metical notes as no one in Mozambique ever seems to have change! #10 How Do I Get a Mozambique SIM Card? There are 2 mobile providers in Mozambique – Vodacom and Movitel. I opted for Vodacom, because this company have the best network signal in South Africa and I was hoping it would be the same in Mozambique. And I’m happy to report it was – in fact the signal around most of the country was excellent, with consistent 3G. Wifi access in Maputo is also very good, but outside that it can be patchy. I bought a SIM card and a data package when I crossed into the country at one of the land borders with South Africa, from a guy hussling on the street. As usual, I didn’t pay him until everything was set up, working correctly and I’d seen proof of my balance. There are also Vodacom shops within every major town where you could get a SIM as well. #11 How Long Should I Spend in Mozambique? Given that tourist visas last 30 days, unless you want to deal with the hassle of an extension, which is possible but not easy (I had a friend here who used an agent, who it turns out was fraudulent because he then got detained on the border when leaving Mozambique! ), then 30 days seems to be a sensible cap on your time in the country. On the other hand, you do not want anything less than a week here – if only because the distances to get to places is significant. If you only have 2 weeks in Mozambique, I’d advise sticking to the south of the country, especially if you are coming from / going to South Africa, Swaziland (eSwatini) or Zimbabwe. If you have longer than 2 weeks for your Mozambique itinerary, then you can explore the north of the country too, especially if you are travelling onto Zambia, Tanzania or Malawi afterwards. 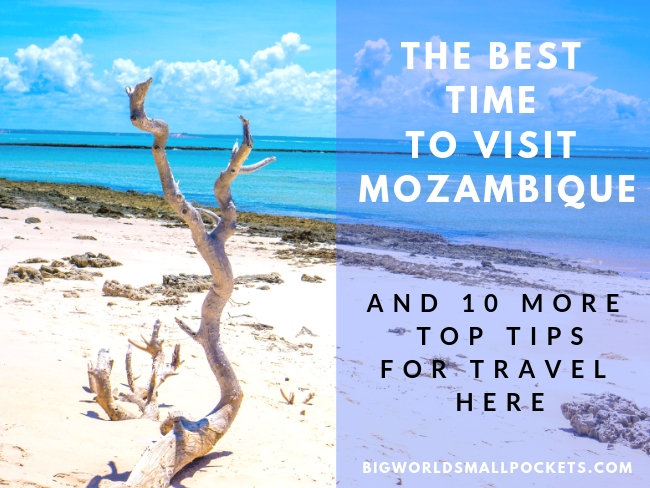 So that’s my round up of the best time to visit Mozambique, as well as 10 of my other top tips for travelling in this country. Have you visited this coastal African gem of a nation? Did you love it just as much as me? What was the best place you visited there?